SAN JOSE, Calif. – May 16, 2012 – Cisco today announced findings from the Cisco IBSG Horizons Study of 600 U.S. IT and business leaders that shows IT is accepting, and in some cases embracing, "bring your own device" (BYOD) as a reality in the enterprise. The study shows some of the quantifiable benefits and complexities associated with allowing employees to use their own mobile devices on their employers' networks. Coinciding with the publication of the study, Cisco also highlighted "Smart Solutions" for the enterprise and opportunities for service providers to help customers, and end users, make the most of mobility experiences in the office, at home, or on-the-go. The study found most organizations are now enabling BYOD in the enterprise, with a staggering 95% of respondents saying their organizations permit employee-owned devices in some way, shape or form in the workplace. This study also concluded that the average number of connected devices per knowledge worker is expected to reach 3.3 by 2014, up from an average of 2.8 in 2012. IT managers are balancing security and support concerns with the very real potential to reap significant cost and productivity benefits from the BYOD trend. What's more, the survey found that BYOD is just the gateway to greater business benefits. Over three-fourths (76%) of IT leaders surveyed categorized BYOD as somewhat or extremely positive for their companies, while seeing significant challenges for IT. These findings underscore that BYOD is here to stay, and managers are now acknowledging the need for a more holistic approach – one that is scalable and addresses mobility, security, virtualization and network policy management, in order to keep management costs in line while simultaneously providing optimal experiences where savings can be realized. These research findings support Cisco's assertion that mobility needs to extend well beyond BYOD to include the integration of service provider mobility, enterprise mobility, security, collaboration and desktop virtualization solutions. 95% of organizations allow employee-owned devices in some way, shape or form in the workplace. 84% of respondents not only allow employee-owned devices, but also provide some level of support. 36% of surveyed enterprises provide full support for employee-owned devices. In other words, they will provide support for any device (smartphone, tablet, laptop, etc.) the employee brings to the workplace. Mobility and device use are on the rise: 78% of U.S. white-collar employees use a mobile device for work purposes, and 65% of white-collar workers require mobile connectivity to do their jobs. By 2014, the average number of connected devices per knowledge worker will reach 3.3, up from an average of 2.8 in 2012. On average, mobility initiatives will consume 20% of IT budgets in 2014, compared to 17% in 2012. Most IT leaders (76%) consider consumerization "somewhat" or "extremely" positive for their companies. 40% of respondents cited "device choice" as employees' top BYOD priority (the ability to use their favorite device anywhere). Employees' second BYOD priority is the desire to perform personal activities at work, and work activities during personal time. Employees also want to bring their own applications to work: 69% of respondents said that unapproved applications — especially social networks, cloud-based email, and instant messaging — are somewhat to much more prevalent today than two years ago. Employees are willing to invest to improve their work experience. According to Cisco IBSG, Cisco employees pay an average of $600 out-of-pocket for devices that will give them more control over their work experience. Benefits of BYOD add up: The benefits of BYOD vary based on an employee's role and work requirements. Cisco IBSG estimates that the annual benefits from BYOD range from $300 to $1,300 per employee, depending on the employee's job role. Security and IT support are the top BYOD challenges: Respondents cited security/privacy and IT support for multiple mobile platforms as the top challenges of BYOD. Device proliferation requires new policy, approach to control cost: According to Cisco IBSG analysis, only 14% of BYOD costs are hardware-related, highlighting the importance of choosing the right governance and support models to control these costs. Companies recognize the value in desktop virtualization: 98% of people surveyed were aware of desktop virtualization. 68% of respondents agreed that a majority of knowledge worker roles are suitable for desktop virtualization and 50% noted that their organization is in the process of implementing a desktop virtualization strategy. Desktop virtualization benefits, three key areas: (1) business continuity so that workers can access applications through multiple locations and devices even if, for example, a server goes down, (2) employee productivity, and (3) IT costs. Data protection is the number one concern: Ensuring that only the right people have access to sensitive company and customer data is a top priority. Cisco offers a broad portfolio of mobility products and services to help service providers and enterprises develop a holistic, scalable approach to their mobility initiatives while keeping operational costs in line and optimizing the user experience. For the enterprise, Cisco is driving innovations around what's called the Cisco Unified Workspace. The Unified Workspace is an integrated and strategic approach to the enterprise workspace that is squarely focused on helping employees access all of the people and resources they need to do their jobs effectively from wherever they are, on whatever device they choose and with an enhanced quality of experience. In short, with the Unified Workspace, everything that makes workers efficient and productive moves with them. For example, instead of an employee just having voice while on the road, why not also provide the worker with location and presence capabilities? As part of the Unified Workspace, employees will access some information on the device itself, like the platform-independent versions of collaboration applications such as Cisco WebEx® and Cisco Jabber™. Other applications or data may be accessed virtually through a virtual desktop centralized in the data center with full rich-media capabilities using the Cisco Virtualization Experience Infrastructure (VXI). To bring this strategy to life, Cisco is offering a set of "Smart Solutions" that have been fully tested and validated and can help CIOs and IT leaders increase business efficiency and remove the cost and complexity associated with mobility. The solutions, built on a common technology framework and backed by services from Cisco and partners, help increase employee satisfaction and productivity by enabling personnel to "work their way," helping ensure the business is highly secure and intellectual property is protected. BYOD Smart Solution: The Cisco BYOD Smart Solution transforms the workspace, providing end-to-end BYOD lifecycle management. The solution helps secure data with unified policy, delivers uncompromised experiences with powerful collaboration tools, and simplifies operations with proactive management. VXI Smart Solution: The Cisco VXI Smart Solution is a desktop virtualization system that spans Cisco's Data Center, Borderless Networks and Collaboration architectures to deliver a superior collaboration and rich media user experience in a fully integrated, open and validated desktop virtualization solution. Remote Expert Smart Solution: Cisco Remote Expert is an integrated solution that will enable a virtual face-to-face consultation through immersive video and online form sharing at work or in the home by identifying and accessing the most appropriate subject matter expert from any location. The enterprise solutions referenced above are key components of Cisco's comprehensive mobility offering which also includes an extensive technology and services portfolio for service providers. Cisco offers solutions that can enable high performance mobile networks, with seamless roaming between cellular and Wi-Fi networks, all while helping to ensure the experience is optimized for the service and devices being used. These technologies enable service providers to meet growing bandwidth demands effectively, while increasing their ability to monetize the customers both on and outside of their networks. For example, just as many coffee shops advertise hotspots today, additional mobility services offered by service providers could enable those same businesses to attract additional customers. According to the next Visual Networking Index Study (to be released on May 30), total devices and connections on the internet will grow from 10.3 billion in 2011 to a whopping 18.9 billion in 2016 – nearly doubling in only five years. This provides service providers with clear opportunities to grow their business and offer value added services to customers. "Cisco's findings tally well with the latest BT research, which found that 82% of companies across 11 countries allow their employees to bring their own devices to work (BYOD), or will do so within the next two years. 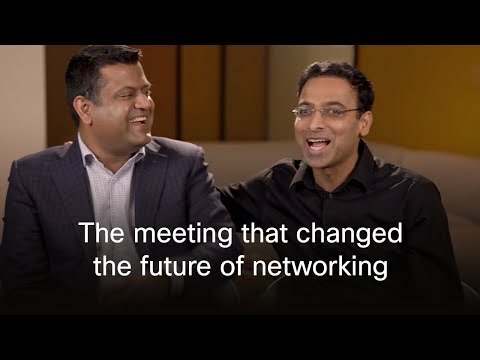 This is why BT and Cisco are working together to address this aspect of the networked IT market covering networking, global Wi-Fi and security." "Wake Forest has consistently sought out innovative technological solutions, being among the first schools to give laptops to all of its students back in 1996. Now, we're continuing that innovation as it pertains to mobility. Our students are very much on the go, especially as many travel frequently throughout the year as part of the ‘go there' experience here at Wake Forest. We want students to be fully engaged even when they're not on campus and find solutions like Cisco Jabber and Cisco WebEx provide that type of capability. They help connect our extended class community. These survey results highlight the changing face of mobility and we're addressing that transition in a way that helps our students receive the best education possible." "As the number of devices being brought into work increases, organizations need a comprehensive mobility strategy. By leveraging the intelligent network, organizations can now provide their employees with the benefits of working anywhere, anytime: in other words, "work your way." Learn More About the Mobile Experience "Your Way"
Cisco IBSG (Internet Business Solutions Group) drives market value creation for our customers by delivering industry-shaping thought leadership, CXO-level consulting services, and innovative solution design and incubation. By connecting strategy, process, and technology, Cisco IBSG acts as a trusted adviser to help customers make transformative decisions that turn great ideas into value realized.